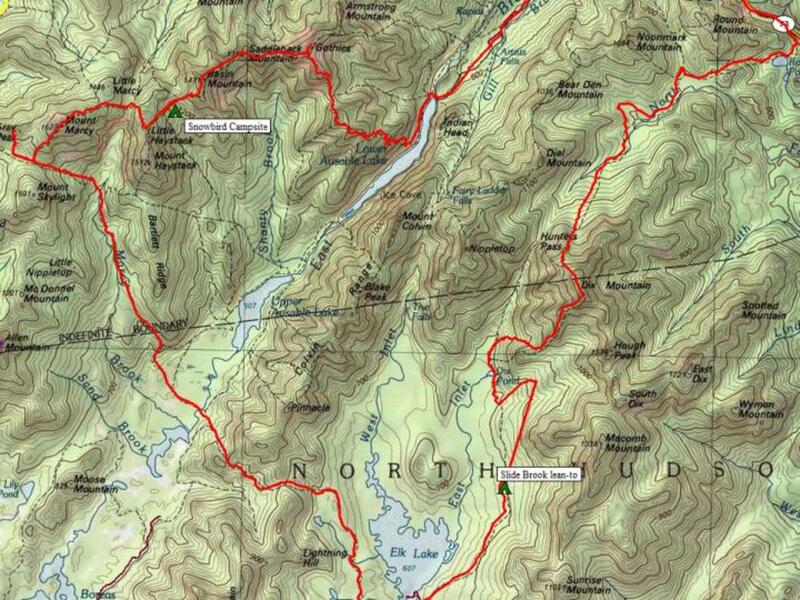 Backpacking for a few days in January in the Adirondack High Peaks, what's the worse that could happen? I'm an experienced mountaineer, why would I allow something in the forecast like "a chance of snow melt" affect my plans when I've hiked in the worst of weather conditions - or so I thought. Then again, my winter backpacking plans often go awry. Perhaps it is the uncertainty that makes my pulse quicken and reminds me to embrace life with a certain fullness. Though, I have climbed all 46 of the Adirondack High Peaks over 4000', I went back yet again to climb in those same majestic mountains. It is an addiction, one I satisfy on my monthly forays to the 'Dacks. This time I was working toward my Winter 46 - climbing all 46 during the winter season. 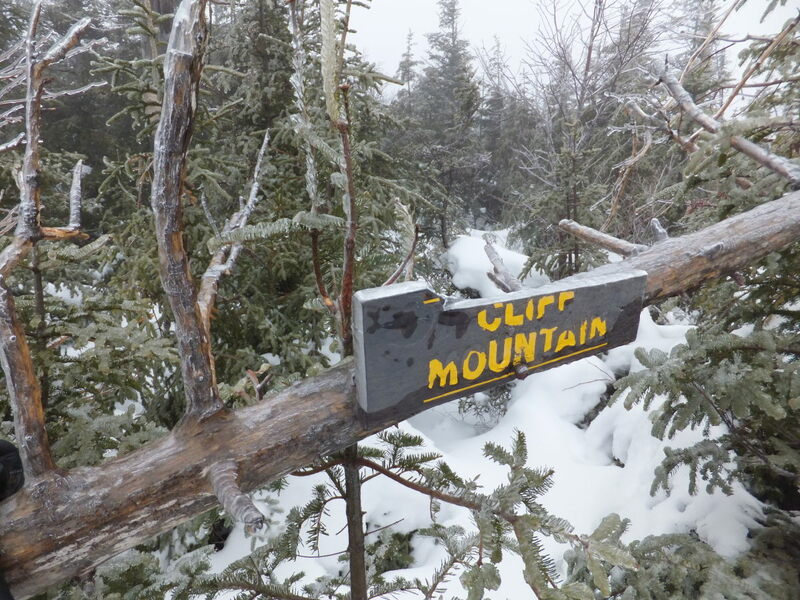 Yes, I've hiked through an ice storm in June, saw snow in August, and been in knee deep snow in April and November - but hiking in wintery conditions doesn't "count." For the 46rs, winter ascents only count between the winter solstice and the spring equinox. So I had a plan, though the more astute of you out there can tell from my intro that I didn't follow it, for a relaxing four day sojourn. 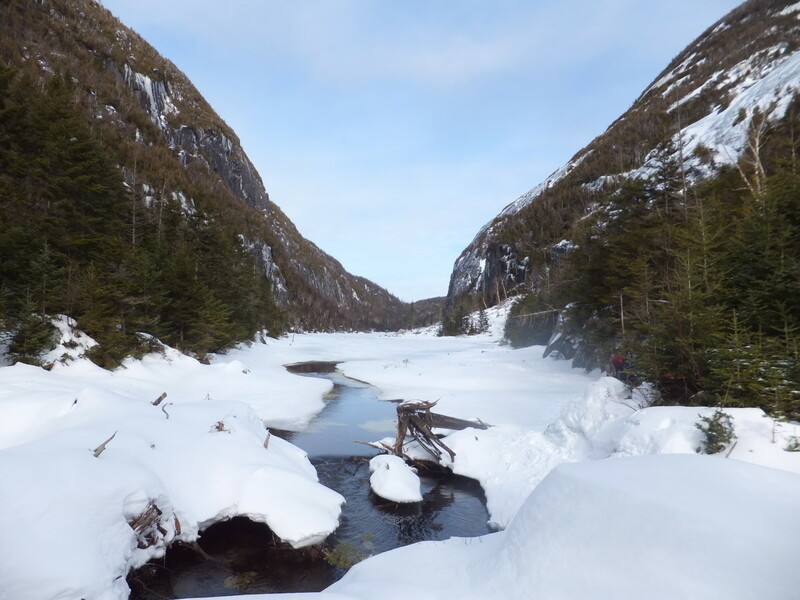 Day 2: Hike from Avalanche Camp to Uphill Brook lean-to and drop my pack. 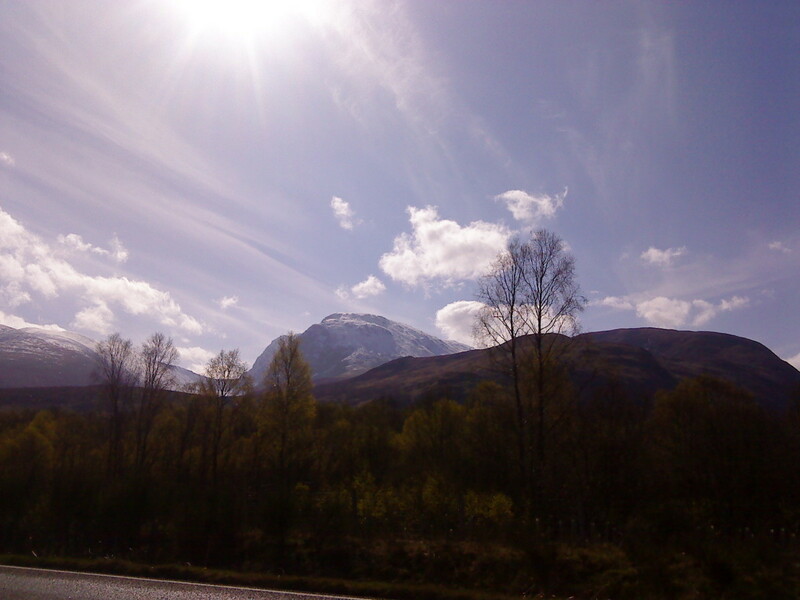 Climb Cliff and Redfield Mountains, and return to Uphill Brook to camp. 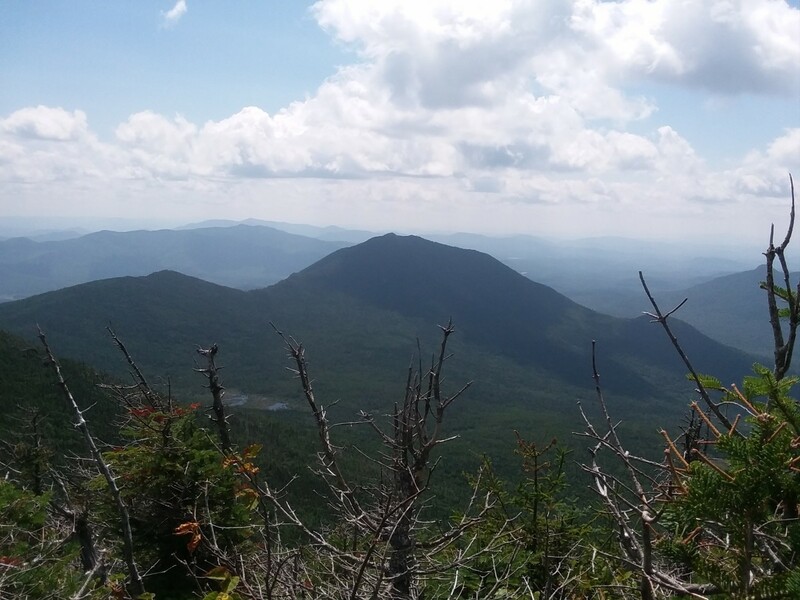 Day 3: Hike from Uphill Brook toward Four Corners. Climb Gray Peak and Mt. Skylight. Carry pack over Marcy - I didn't need Marcy for winter, but it is always an awesome mountain to climb. Descend down to Marcy dam area and camp. Day 4: Have a lazy morning and hike out the two miles to the Loj and drive home. A simple plan, right? It didn't seem too ambitious, all I needed was a little luck from the weather. I parked at the Adirondack Mountain Club's Loj Heart Lake campground. For those spelling sticklers out there, you may notice the odd spelling of "lodge." That spelling is the result of former Lake Placid Club member (and inventor of the Dewey Decimal System) Melvil Dewey and his movement toward simplified spelling. The Loj is a popular place to park for easy access to the Central High Peaks Region. However, a parking fee is charged for all users - discounted rates are available for ADK members. This is a short day, only about 4 miles with my wandering, but intentionally so. After the six-hour drive to the High Peaks from the Buffalo area, it's hard to motivate oneself to have a major mileage day. I didn't even get on the trail after gearing up and paying for parking till almost 3:15 PM, so I knew a nice relaxing short day was in order. As usual, the trails around Loj were packed well with hard snow allowing for quick easy travel, almost everyone was wearing microspikes for traction underfoot. Though I started with crampons, my snowshoes hitching a ride on my backpack until needed later, I stowed the crampons after realizing it wasn't too slippery out. I bare booted the rest of the day, the lugs from my Keen Delta boots grab the ice well with a technology called "Keen.Grip." Though, I knew the bridge at Marcy dam was obliterated by the force of water from Tropical Storm Irene, I honestly was expecting a more established reroute this close to the Loj. The trail now abruptly turns and crosses over a rocky area of Marcy Brook. In drier times, one could easily rock hop and stay dry - but this was a moment I was glad I had waterproof boots. 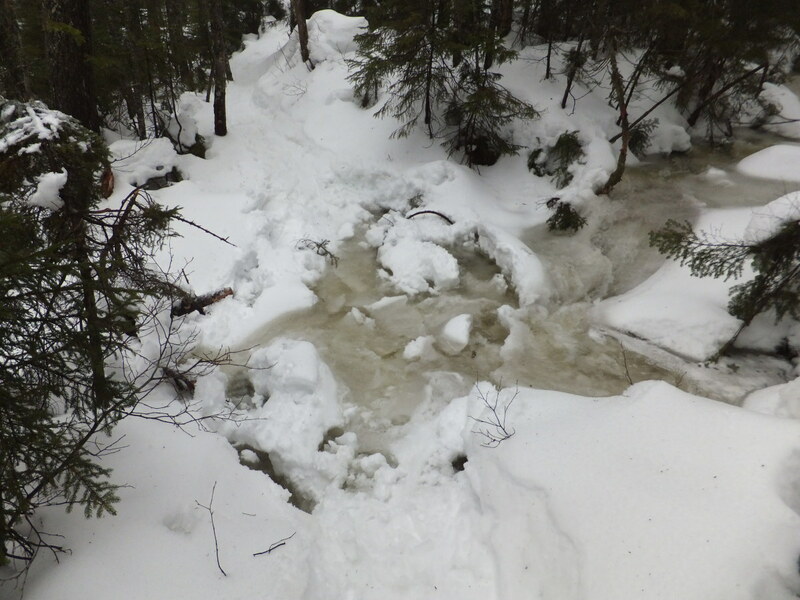 I wonder if this brook crossing will keep more passive backcountry visitors at bay. After the crossing two strands of the Brook, the trail emerges out onto the South Meadow truck-trail, which leads you easily to Marcy Dam. 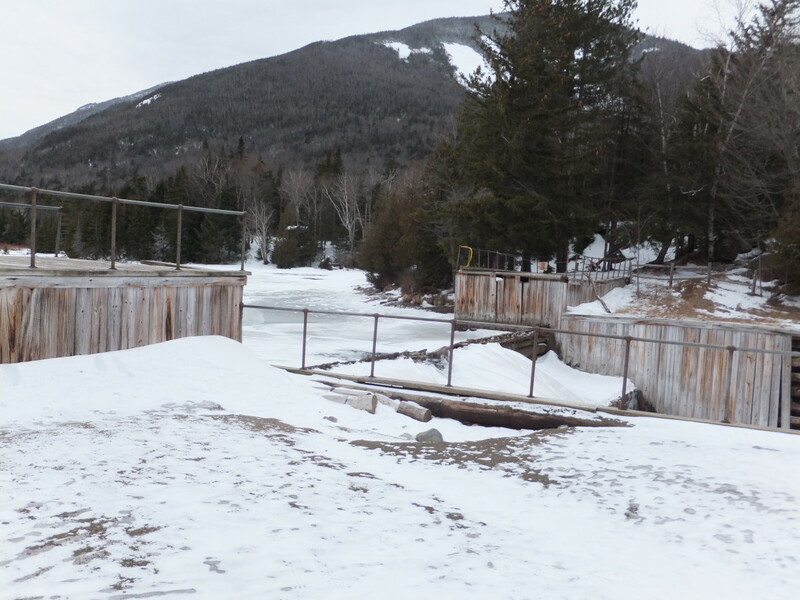 Even on the coldest winter day there is always a flurry of activity around Marcy Dam. At only 2-miles from the trailhead with plenty of camping, it is no wonder it is always so busy. Though they are hibernating now, this place is also a favorite haunt for hungry bears searching for campers careless with their chow. For such reasons DEC approved bear-resistant food containers are required between April 1st and November 30th in the Eastern High Peaks. Being winter, you still have to keep your food safe though - especially from martens and mice. These little critters will chew a hole through your backpack to get to that granola bar inside. 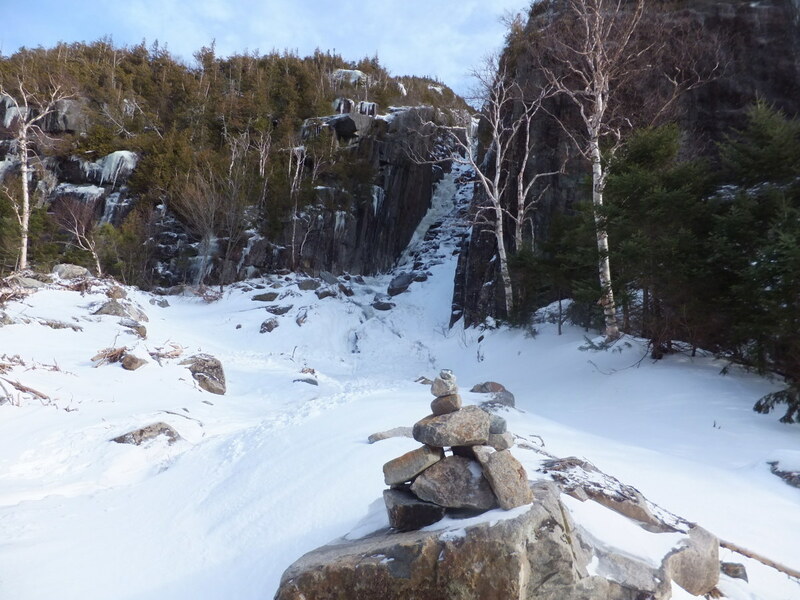 I took the gentle trail away from the dam, passing the occupied lean-to at Marcy Brook, opting instead for solitude at Avalanche Camp. The last time I camped here was on a very cold December weekend a few years ago, but today was in the 30's even as the sun set over the mountains. I downloaded the tracks from this trip from my Gramin Map60 CSX GPS into Google Earth. Sure my boots are waterproof, but they only take submersion so many times. 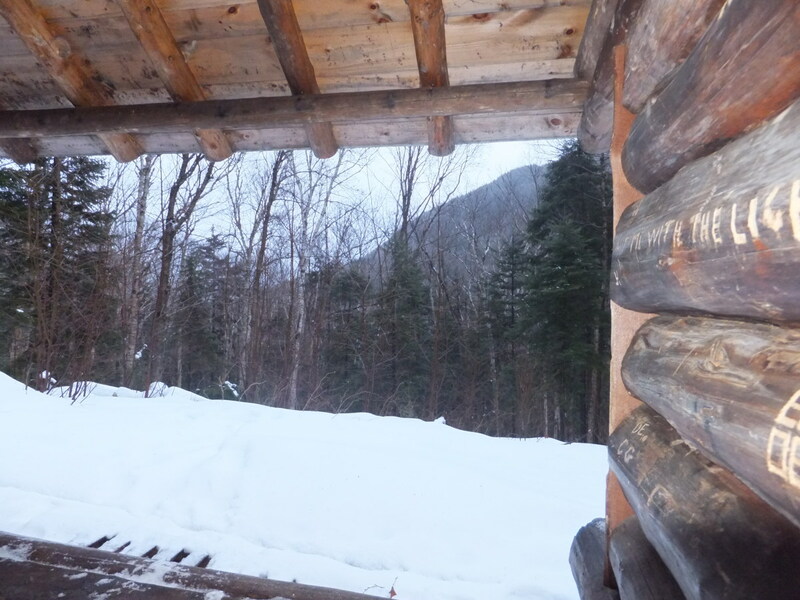 The sound of sleet hitting the lean-to roof was an unpleasant sound to wake-up to at 4 AM. I shined my headlamp into the darkness, noting the reflection of the light in the grainy ice pellets, and promptly tucked myself into my down cocoon. Something told me then, it wasn't going to be a good day - I probably should have listened to my instincts and stayed in my sleeping bag. I finally eased myself out of my sleeping bag around 6:30, made a little coffee, heated some water for the day ahead, and wolfed down a Cliff bar. I then realized that I wasn't wearing any gloves and was quite comfortable. I can't ever remember winter camping in January and not wearing gloves, but as the sleet turned to rain outside, I realized why. My Marmot sleeping bag beckoned my name, but I stuffed it back into it's waterproof stuff sack and packed the rest of my backpack. As I trudged up the trail, I was glad I decided to wear a hardshell jacket and pants. My new Mountain Hardware Victorio jacket easily repelled that rain, sleet, snow mix and kept me dry inside and out. Though my softshells are great, in mixed precipitation like this a hardshell garment is really what you need. Passing the trail to Indian Falls, the trail became really wet. 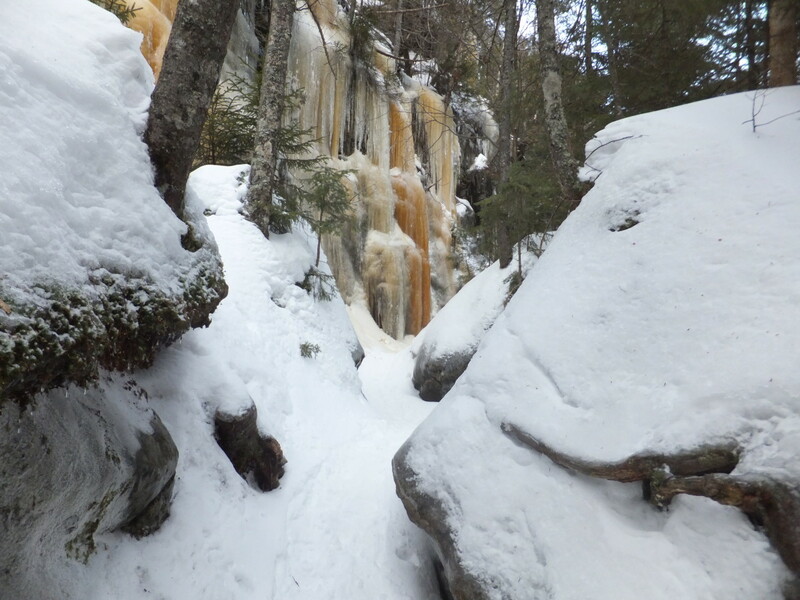 At first, my snowshoes glided across the slushy surface, but as I climbed higher the slush became wetter and wetter. 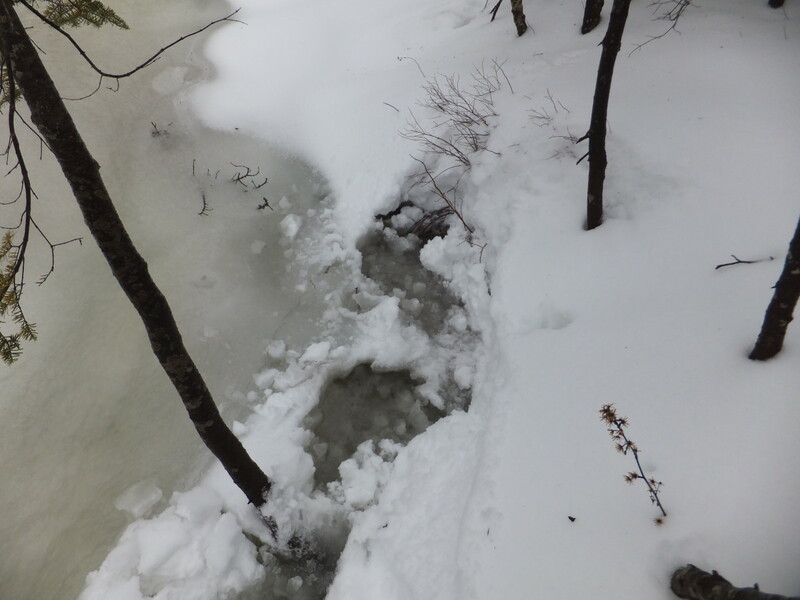 Soon I was breaking through the thin ice layers into the flume of water that ran down the trail bed. I could turn back, but I decided to press on with each heavy step sinking to my knees in wet slush and water. All I had to do was keep climbing and eventually I'd climb out of this snow melt, right? After passing the mist shrouded Lake Arnold, the trail became firmer as the drainage departed the trail. When I reached the branch of the Opalescent in another mile, the crossing stones were underwater - it looked like it was time to get wet again. I unbuckled my waist belt and planted my poles firmly into the rocky river bottom. I reached out with my snowshoed foot and moved cautiously through the quick moving river - ice chunks hitting my legs as I moved. I had some pretty good leakage in my boots now. Sure my boots are waterproof, but they only take submersion so many times. Finally I reached the intersection with the Feldspar Brook Trail, looking to my left toward Mt Marcy and what I hoped to climb the next day. Easily, I hopped across Uphill Brook - when I returned it wouldn't be so. I proceeded to Uphill Brook lean-to, to drop my pack, as it is where I planned on spending the night. 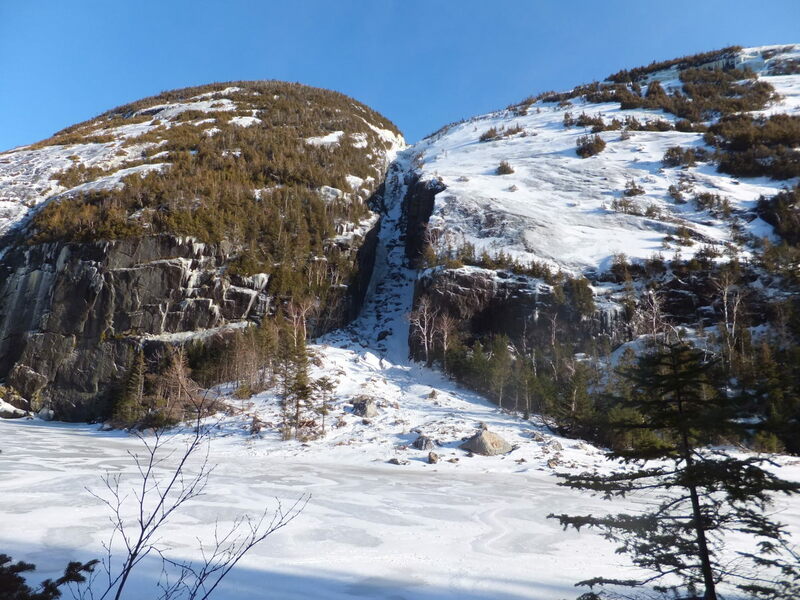 I dropped my main pack, grabbed my summit bag with emergency supplies and headed toward the Cliff and Redfield herd path behind Uphill Brook lean-to. Though the trail to both of these peaks is an unofficial "herd path" meaning that it is not marked nor maintained, they are both easy to follow - even in the snow. Because it is the harder of the two, I decided to climb Cliff first. You've already done the majority of the climbing by getting up on that ridge, so the ascent up Cliff is pretty easy except for a few very steep pitches. The snow was soft and slippery as I dug into those vertical sections - I kept my snowshoes on for more surface area and better grip while ascending. In one place I couldn't get a handhold on anything, so I used my ice axe to heave myself up while kicking in with the sharp crampons on the toes of my snowshoes. As always, it is usually easier climbing up a pitch than down a steep slope - but I had an easy solution for coming down safely. After climbing those steep parts, I reached the plateau which continues on for .4 miles till you reach the, ummm rather unimpressive summit. Like all mountains, the destination is in the journey and not always the reward of a fantastic summit view. This day, with a rain / snow mix and limited visibility, made this wooded summit even more blah. In my previous ascent of this peak it was raining too, but I hear there are some great views off to the South side. I quickly snapped a picture of the broken summit sign, protecting my camera from the rain, then headed back down to the col. I was able to get down the first steep section okay, but for the second pitch (the one I used the ice axe to climb) I needed some extra help. I wrapped my rope around a tree that made a good anchor, lowered my summit pack, then did a dulfersitz rappel down that section. For most short rappels, these non-mechanical wrap methods are fine for getting you safely to the bottom. The thought crossed my mind that walking through waist deep freezing water is something Bear Grylls would do. Of course, he has a full camera crew and I was out here alone standing in a mountain stream in winter. Standing at the Cliff -Redfield herd path junction, the sound of Uphill Brook sounded louder than it did two hours prior. 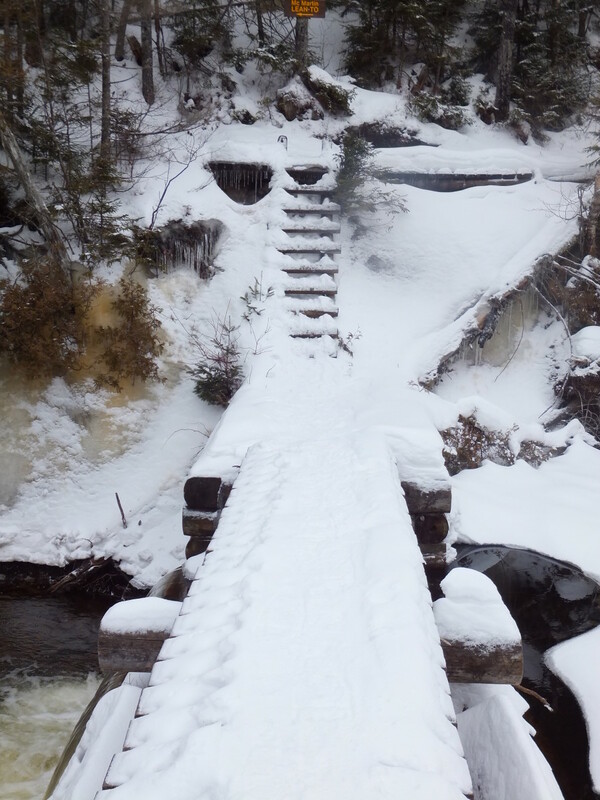 There still weren't any fresh snowshoe tracks heading toward my destination, so I pushed on up the trail, handrailing the roaring brook to my left. Coming into visual contact with Uphill Brook, I realized how fast and how much volume of water was cascading down. It was a virtual rapids in many places. As I climbed higher and the trail began following drainages from the summit, the trail grew softer and wetter. 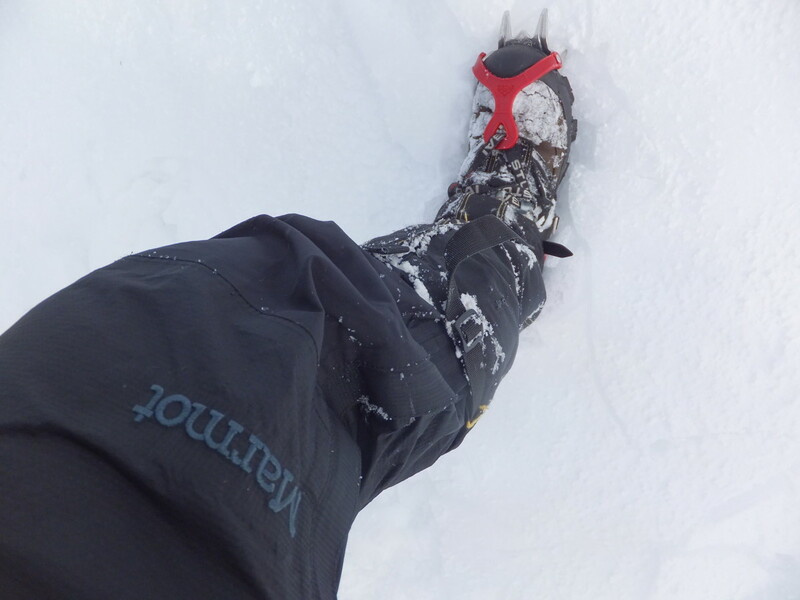 Even with snowshoes, I began sinking in to a slush that lied underneath the crust of snow. 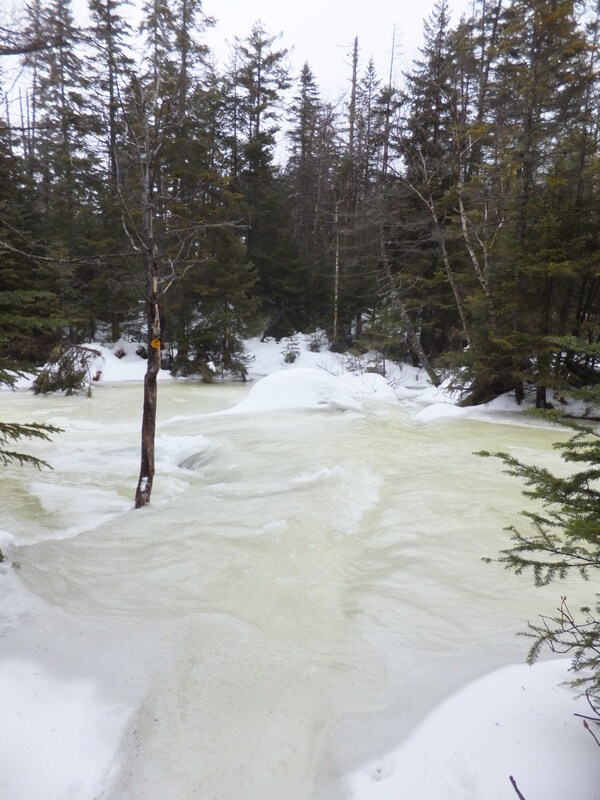 One of the feeder streams was very high, but I pushed on with my eye on the summit. Yes, the water was up to my thighs, but my technical clothing kept me warm and a little dry. My boots though, already soaked from wading through copious amounts of water, were beginning to freeze. My toes were starting to feel a little numb too, so I stopped took off my boots and pulled my Integral Designs vapor barrier socks over a pair of dry socks. Though VB liners can be uncomfortable to hike in, they'll keep your feet from freezing and I knew they'd keep my feet a little drier. I pushed on, reaching an area where I knew I'd have to cross the main brook to reach the drainage that would take me to Redfield's summit. I took a step on the snow then plunged deeply up to my waist in icy snow melt. I was in a stupor, paralyzed, as chunks of ice carried by swift currents rushed by my legs. I pushed on and the water became deeper. The thought crossed my mind that walking through waist deep freezing water is something Bear Grylls would do. Of course, he has a full camera crew and I was out here alone standing in a mountain stream in winter. 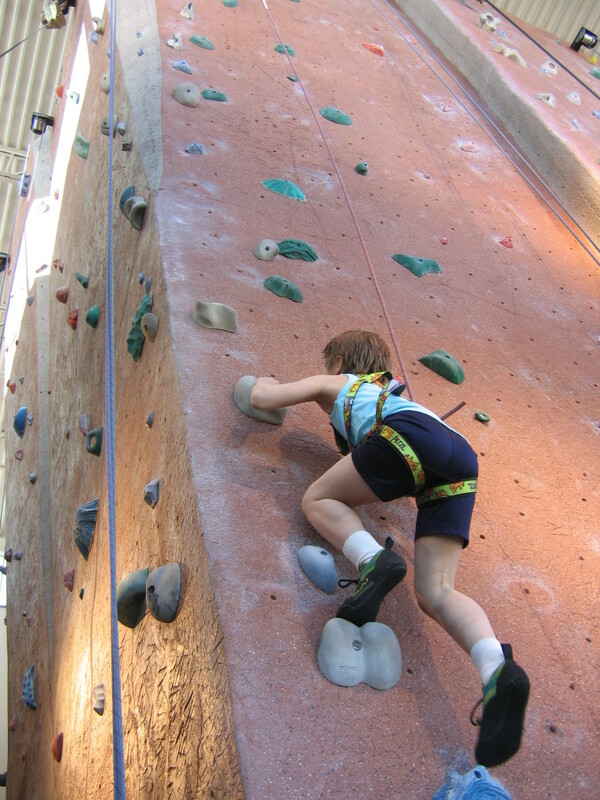 "Getting to the summit is optional but getting down is mandatory." I pulled myself out of the water, took one final look at my map for an alternate route, then headed back down the mountain. I wouldn't be climbing Redfield today. 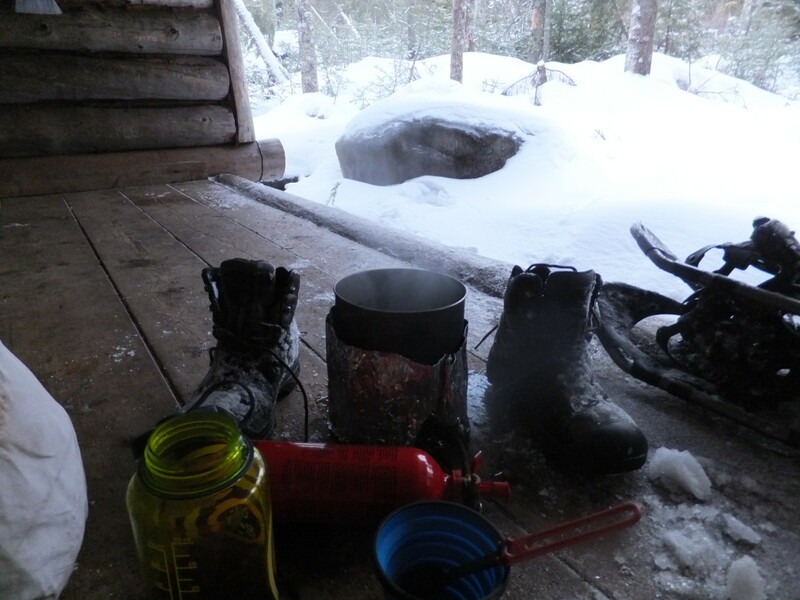 I returned to the lean-to by 3:30 and pulled out my stove to make an early supper. Grabbing my empty water bottles, I headed to Uphill Brook to where it crossed the trail. I thought I made a wrong turn, for the four-foot stream I hopped over four hours previous was now a raging 30-foot wide deluge of water. I tested the waters, wading out a few feet and sinking above my knees. I was barely able to stand upright. As the water rushed by me I knew, I wouldn't be able to cross this to get to Marcy, Gray and Skylight mountains tomorrow. Unfortunately, the way I came up and my intended exit was now blocked. I didn't imagine the waters would recede any overnight, but I'd return to the Uphill Brook lean-to to camp. I could always take the trail to the west and exit via Lake Colden. As I started thinking about that new route, I remembered all the side streams that flowed into the Opalescent River. I bet those would flood out too. It was then I realized, I had to get off the mountain completely before I was totally blocked in. I threw everything haphazardly in my pack, and started quickly down the trail with less than an hour and a half of sunlight left. 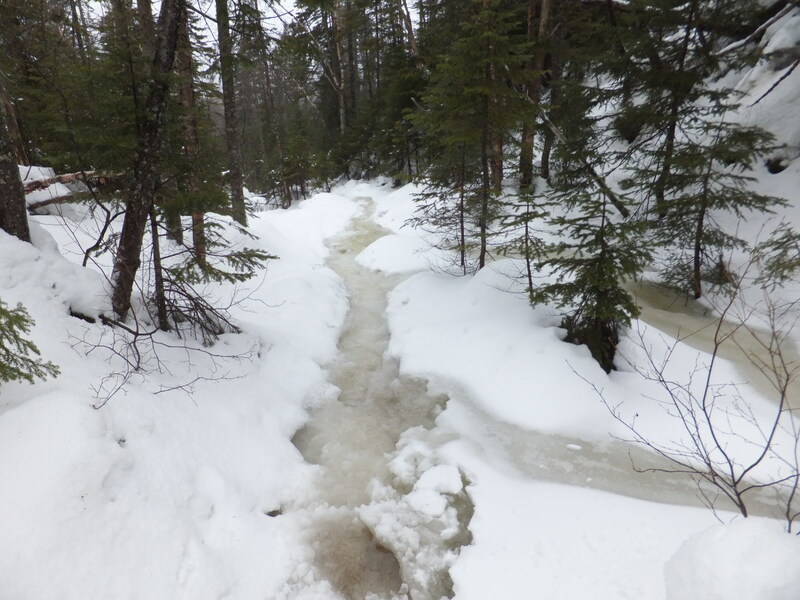 It was good I left when I did, those small streams that I usually snowshoe over were already knee deep in places. I started worrying about the suspension bridge over the Opalescent River, but I was relieved to see the snowbound swinging structure was in sound shape. 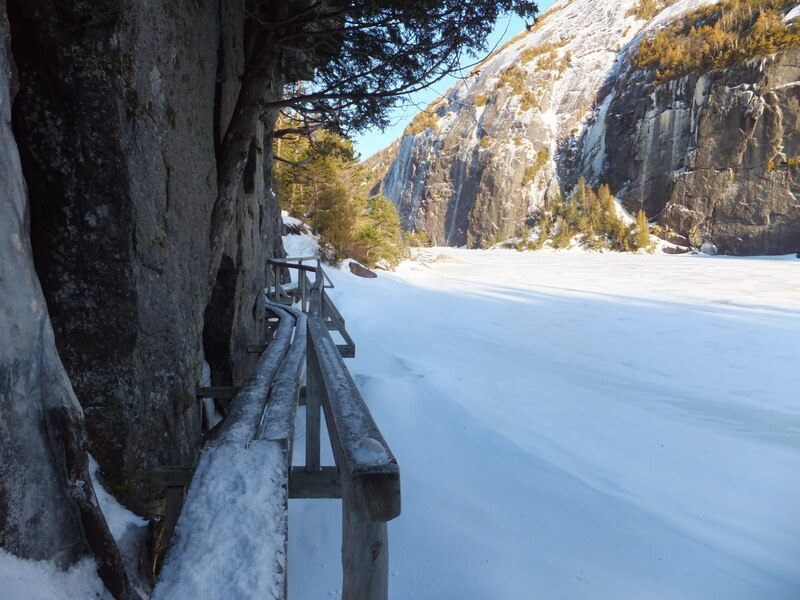 I reached Lake Colden after dusk, pulled the headlamp out of my pack and pushed on to the nearby McMartin lean-to. I went to work, melting snows, boiling water, making supper, and switching out of my wet clothing before passing out for the night. I slept great that night, only awoken a few times to have a staring contest with a hungry shelter mouse eying my hanging food sack with an ambition toward gluttony. But as I emerged from the cozy confines of my sleeping bag i was glad for the cool crispness in the air and the lack of precipitation as I peered out of the lean-to. This was going to be a nice day. Before falling asleep, I stored the really wet things like my socks in between my sleeping bag and thermarest mattress - it dries them out a little and keeps them from freezing. The semi-damp things, like my baselayers I stuck in my sleeping bag - my body heat dried them out overnight. Then there were my boots - soaked through and through with continuous deep submersion. If I didn't keep them from freezing, if I could get them on at all in the morning, it would be an uncomfortable walk out. I turned my sleeping bag stuff sack inside out, threw the boots inside, and put them inside the hood of my sleeping bag. True comfort: soaking wet frozen chunks of leather and nylon for a pillow. Examining the map over a half-nalgene of coffee and a small bag of gorp, I planned my new exit. I had to climb something else while I was out here, but the nearby trails to the MacIntyres were likely to be more stream beds. I hadn't been up the iconic 4,714' Mt. Colden in a few years and it looked like it may actually be a nice clear day for a summit bid. Plus, I was pretty sure that the trail wasn't a drainage from the summit. Then again, I had never been up Colden this particular way. After hiking around to the East-side of Lake Colden and photographing the interior ranger station across the lake, I reached the Colden Trail. I dropped Big Bertha - my 75 liter Gregory Baltoro, and I packed emergency supplies into my summit pack. For those of you wondering what you should bring along in your summit pack, check out The Ten Outdoor Essentials. The big thing to remember, is that you must be able to spend the night (or nights) with what you have with you. Again, only snowshoe prints pressing down the two-inches of fresh powder were visible in the snow. It looks like the unfavorable weather was keeping people away, even on the weekend. The ascent up Mt. Colden was steeper than climbing up the other side, but the trail was one of those pleasant trails with interesting cuts and great views as you turned around. Best of all, the snow was crunchy and the trail was dry; my feet welcomed the change. As I crossed into the Alpine zone, as marked by signs warning the traveler to stay off fragile plant life, the trail became icier. Though my Tubbs Mountaineer snowshoes grab the ice well while climbing, it is tricky while negotiating the dips on any mountain top. 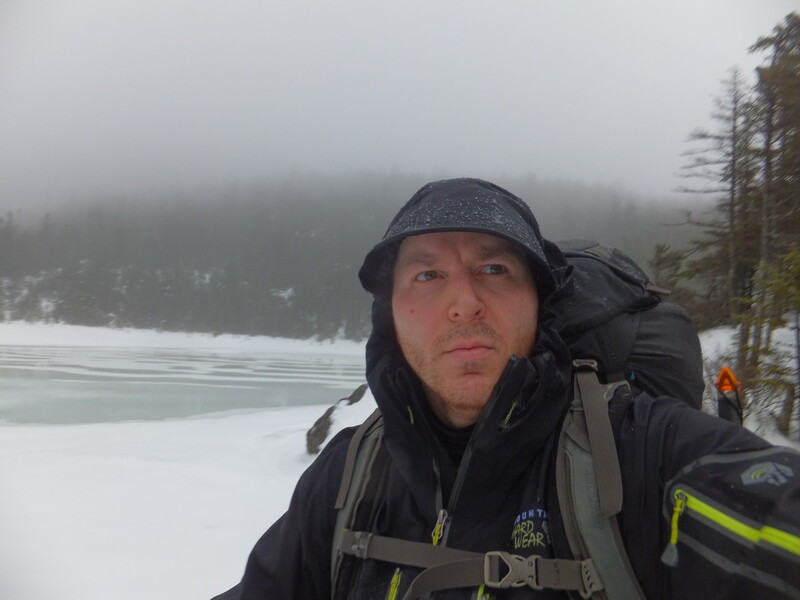 I switched into my crampons, and strapped my snowshoes to my pack. 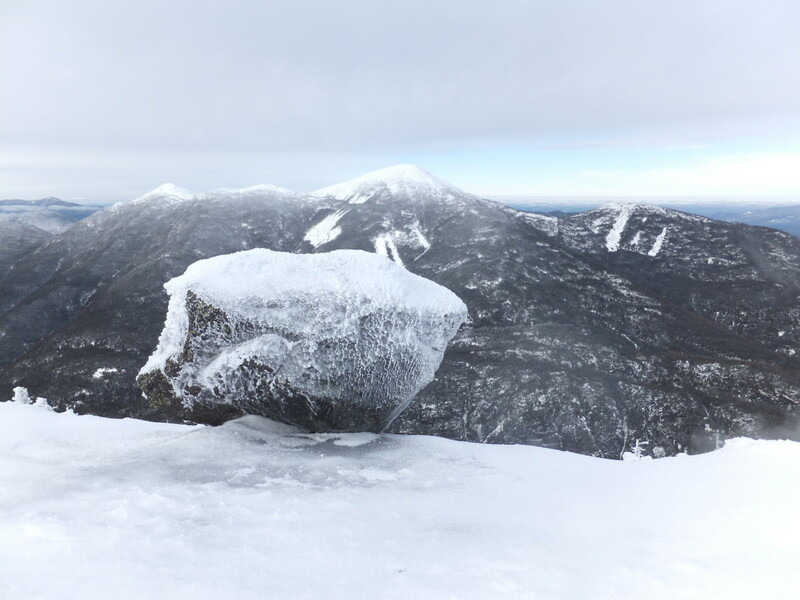 The ice on top of the mountain was packed hard from the harsh winds and fluctuating temperatures. 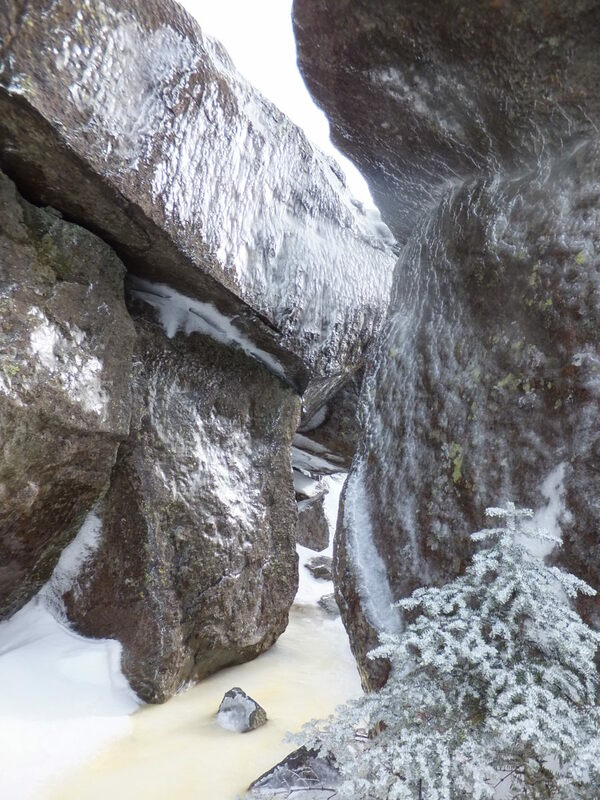 My crampons barely penetrated the ice while walking; I kicked in each step as I climbed higher and higher. 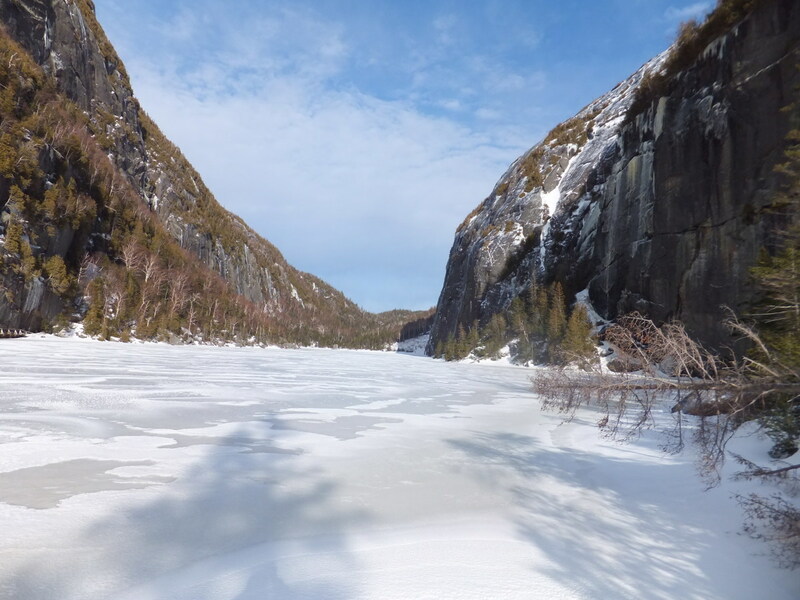 The indentations on the ice would make great places to lock my heels as I descended. 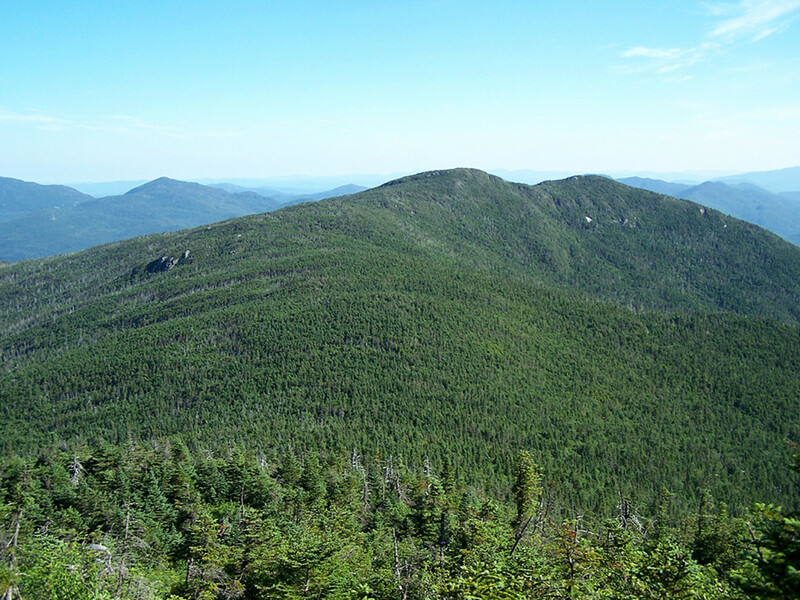 The summit of Colden is a plateau, the actual summit located amongst a small stand of wind-beaten spruce. The better views are along the ridge looking down toward Lake Colden and over to the MacIntyre Range. I could see people on the summit of the Algonquin across Lake Colden, and I zoomed in with my camera to see the black specks waving their arms in jubilation on top of the 5114' peak. I began to chill down and threw on my down summit jacket as I took in the awesome view. 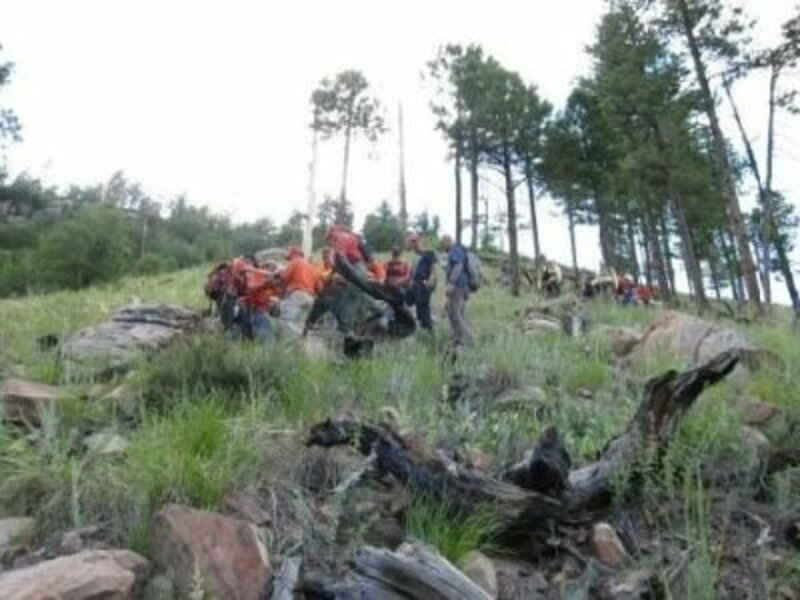 Soon, I heard voices and saw several people coming up from the Lake Arnold Trail. Besides dots on distant peaks, they were the first people I saw since Marcy Dam. I chatted with them a bit, and let them be with their own time on the summit. I started down the mountain, bracing with my ice axe to self-arrest myself if needed. It would be a long way down with a very sudden stop if I slipped. Despite a pretty miserable previous day, the cold crispness and the shining sun made this the best day I ever had on Colden and one of my better days in the High Peaks. 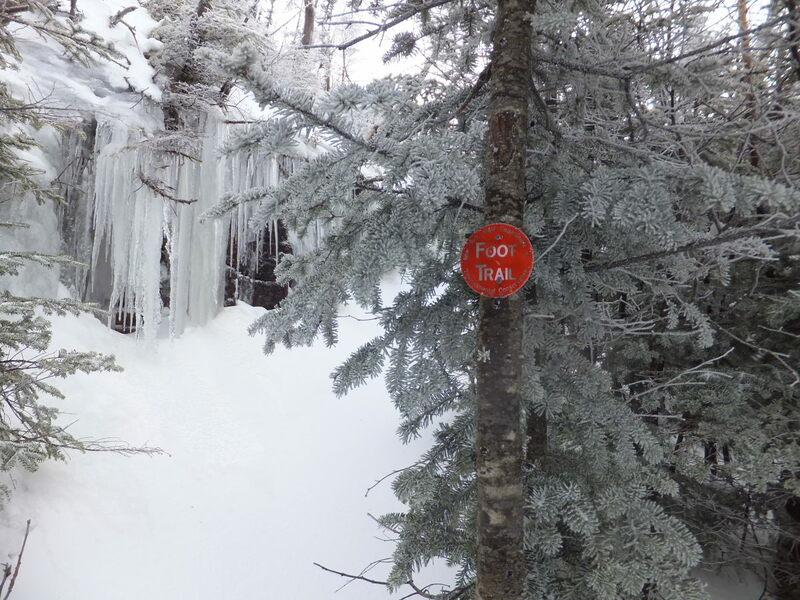 When it is this icy and steep, switch out snowshoes for crampons - especially while descending. It's easier to kick steps in ice with crampons. 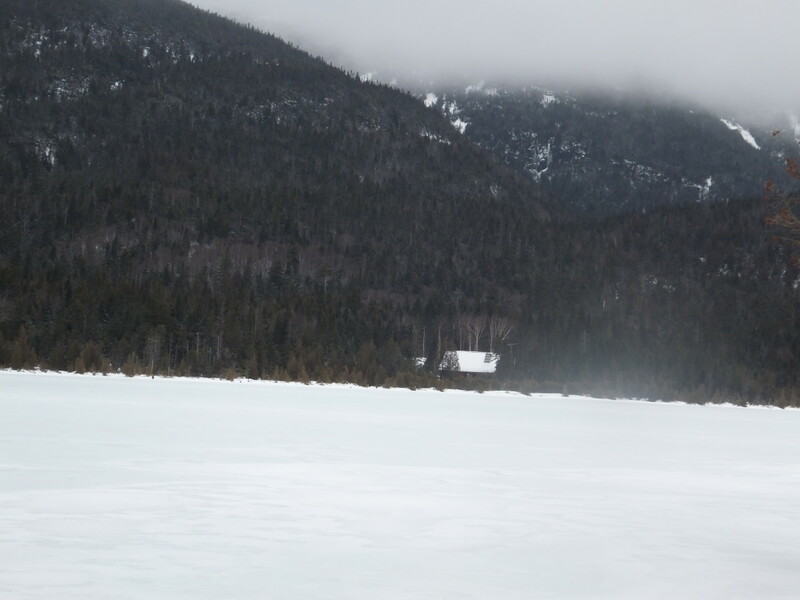 After reuniting with my behemoth pack at the base of Mt Colden and reassembling my kit, I headed down to the snowy shore of the Lake. 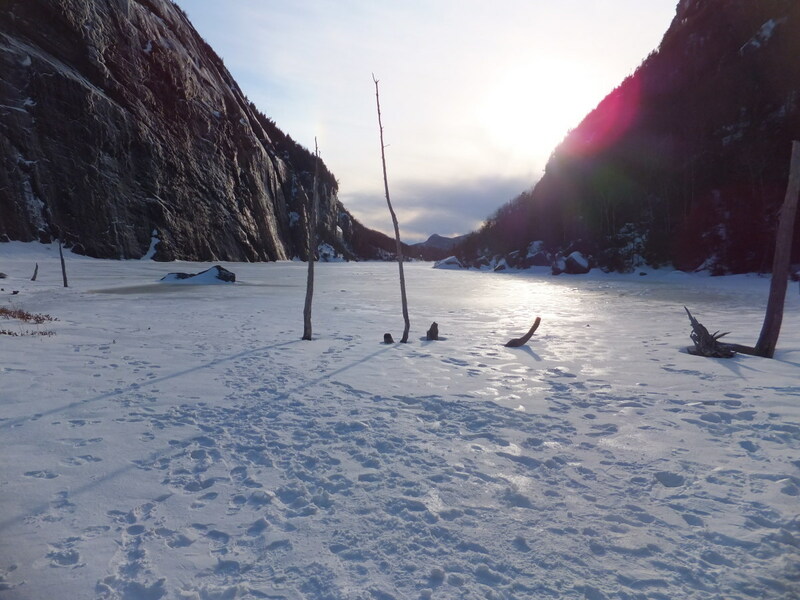 The snowshoe tracks in front of me alternated between the trail and the icy lake. Having had pretty bad luck with ice in the last couple days, I opted for soil under the snow. Finally I came to one of the most beautiful places in the Adirondack Park, maybe in the world: Avalanche Lake. I only wish I had the photographic skill and equipment to do it justice, but like all beautiful places - you have to see it for yourself. 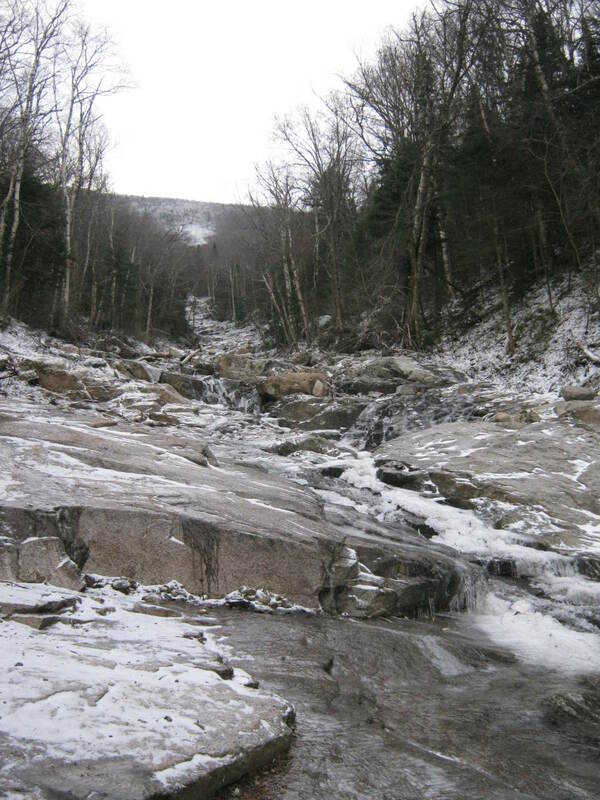 I knew the Trap Dike, a large cleft in rock that leads to the summit of Colden, suffered some changes as well due to the torrential rains of Tropical Storm Irene. I hiked along the herd path on the Eastern shore and was amazed at the amount of trees and vegetation pushed down the mountain. I picked my way through the flotsam like I did on the Cascade Snow Princess Slide. Many of the small trees than clung frailly to the rocks in that pass were now at the base of the mountain and it looked steeper than ever. It looks like the Dike is now a "technical" climb - especially during winter. After checking out the Trap Dike and boiling some water for soup, this was the perfect place to chill for a few hours and recharge in the winter sunlight. I gradually made my way around the lake over the copious boulders and made it to the north end as the sun began to set: perfect timing. I waved goodbye to the Lake and headed through Avalanche Pass toward Marcy Dam. There is no cooler place to be than Avalanche Pass as the sun begins to set over the mountains. The sudden stillness of the Pass combined with the myriad of boulders rained down over the centuries with twilight's shadows dancing around you, makes this a beautiful yet slightly eerie place. By the time I reached Avalanche Camp and began to retrace the steps I took a couple days prior, the early winter evening had set in. 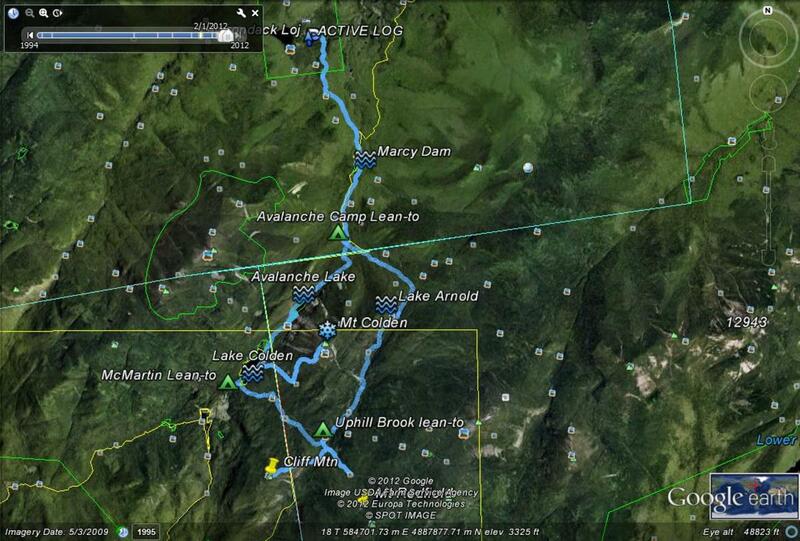 The trail is easy though to Marcy Dam, so I left my headlamp in my pack. I did however need my light as I reached the reroute over Marcy Brook. What was a rock hop and a wet foot, was now calf deep. Oh well, only two miles to go: I hoofed through it. I ran into another group of hikers that had just climbed Algonquin and were now heading back to the Loj. Adjusting my gaiters and waiting for them to pass, I walked back in the nighttime quietness to the parking lot. I've been asked, "why do I hike in winter?" Quite simply, it is to test myself, to push my body and mind as far as it can go. I guess I found out that waist deep was as far as I was willing to go. Of course, the thing that makes a fantastic trip, is when you are wet and miserable and close to death. It makes for great story telling and memories for a lifetime that only took hours to make. The Cranberry Lake 50 (CL50) trail is a wilderness backpacking route that passes through the Five Ponds Wilderness Area in the Adirondacks. Outbound Dan Human offers tips from his two-day 54-mile hike of this trail. It must be so beautiful to reach those heights, especially in the winter. Nice post... I enjoyed reading it. And glad you made it out safely. It sounds like you made the right decision not to continue up Redfield. Thanks for stopping by Flickr. Yeah, the snow levels this year are rather dismal, making it tough for many winter activities. nice hub. The Adirondacks is one of my favorite spots to go camping. Thanks for sharing. Not a lot of snow this year uh? Good hiking. Don't mind if I do then, Outbound Dan! Keep the amazing Hubs coming! It's amazing though what a little snow and ice will do to add excitement to a mere walk in the woods. You are more than welcome to live vicariously through my adventures and thanks for stopping by Simone. This is so cool. I've always been somewhat horrified by the idea of hiking or camping in the snow, but your account makes me realize how exciting, refreshing, and adventuresome the experience can be. Though... I think I'll stick to living vicariously through you. I'm still not ready to try anything like this myself! Thanks for stopping by and commenting Suhail. "Following Atticus" is on my reading list; from the excerpts I've read, it looks fantastic. I'm about a third of a way through my New Hampshire 48, so it'll be a good inspiration. I liked this adventure with a nice write-up, lots of pictures and a nice video, especially because I just came back from a hike of my own (with my Kuvasz boy K2) in snow at -17 degree centigrade. 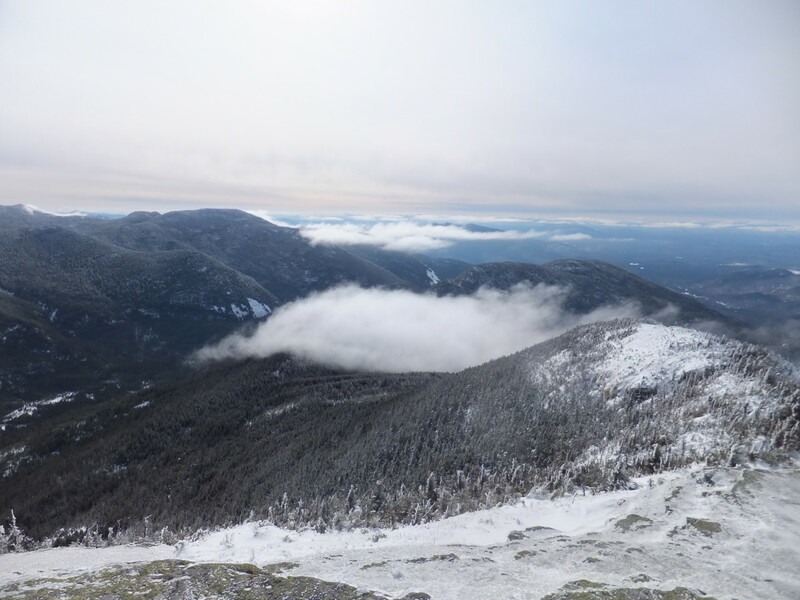 Also, it was nice to read your hub immediately after completing Tom Ryan's recently published book 'Following Atticus' where he described his conquering 48 high peaks of New Hampshire with his miniature schnauzer in the lead. Finally, it was interesting to read your quoting my favorite mountaineer Ed Viesturs. In fact, I quoted the same quote yesterday in a hub by Billibuc on Mount Rainier LOL. I guess that is the point of high adventure, the more terrifying it is the more memorable it becomes. Thanks for stopping by and commenting! Wow, fascinating adventure. 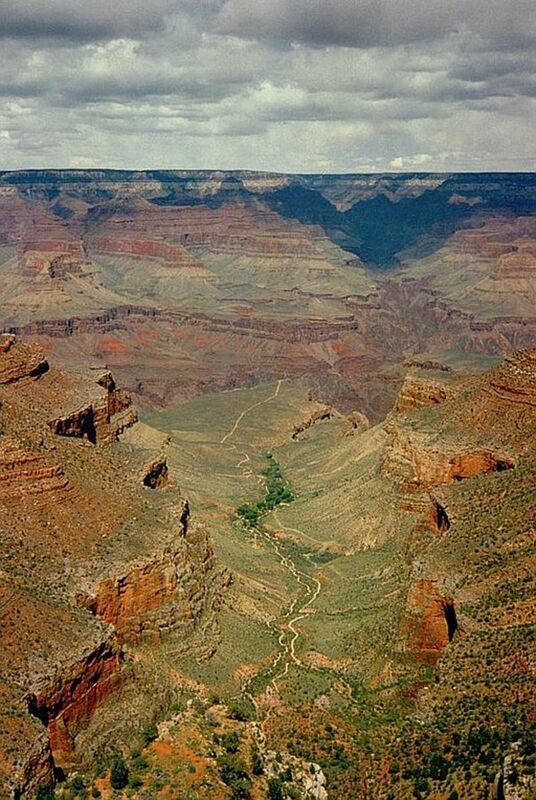 I wish I had the guts to take a hike like this. I have only hiked once in the Rocky Mountains but it was one of the most memorable (and terrifying) experiences of my life.